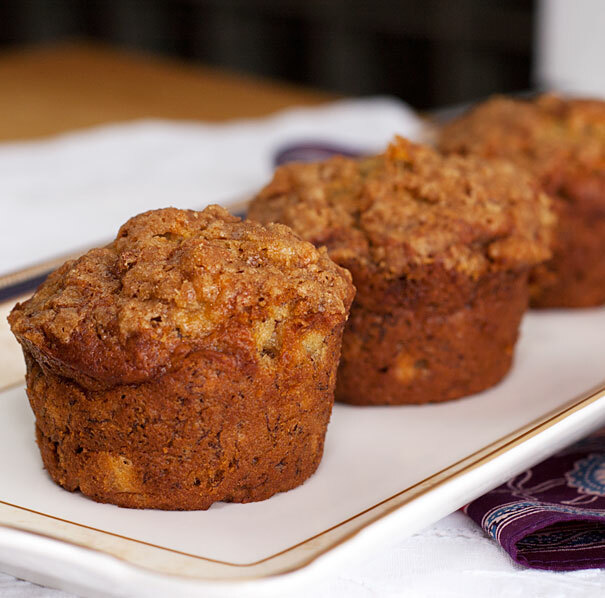 These are the best banana muffins I've ever eaten. Seriously good. Add chocolate or nuts - anything that suits your fancy but simply plain they're fantastic. Mash bananas and add the lightly beaten egg, sugar and butter and mix well to combine and set aside. In another bowl add the flour, baking soda, baking powder and salt and whisk well. Add nuts or chocolate or whatever add-ins you want to the dry ingredients. Add dry ingredients to wet ingredients and mix until nearly all the flour has disappeared. Overmixed muffins are tough. Pour into greased cupcake pans (add streusel if you wish) and bake for about 20 minutes. Touch the tops and if they spring back, they're done. Place all ingredients into a food processor and pulse until it's streuselly. (or crumbly) If you don't have a processor, a fork works just fine - or your fingers.